Product families have a characteristic energy and carbon “footprint” – the consumption and emission over life. They also have a characteristic “fingerprint” – the way this energy and carbon is distributed between the material, the manufacture, the use and the disposal phases of product life. Understanding this fingerprint helps you understand how best to redesign the product or to change its use-pattern to reduce its energy consumption and emissions. 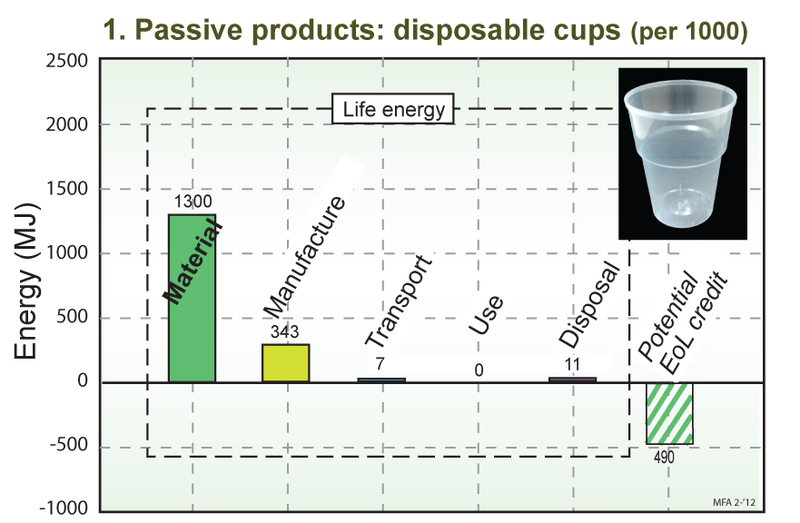 Life-cycle assessment (LCA) traces the resources consumed and the emissions excreted during each phase of product life. The output is a sort of biography, documenting where the materials of the product have been, what they have done and the consequences of this for their surroundings. A full LCA is arduous and expensive. An alternative is a fast Eco-audit that can be up-dated with little effort as the design evolves. It is approximate but the distinctions that it draws can be sufficiently sharp to distinguish the most damaging phases of product life and guide redesign to improve eco-performance. The output is an energy-fingerprint: the characterizing pattern of energy consumption across life. The carbon emissions (and those of sulfur, and nitrogen) do not scale exactly with energy, but since so much energy of the energy we use is derived from hydrocarbon fuels, the energy fingerprints are a sort of proxy for the others. Computer Based Tools that allow fast Eco-audits now exist – an example is Granta Design. I won’t describe the tools here but instead I go directly to their output. The diagram below introduces it. 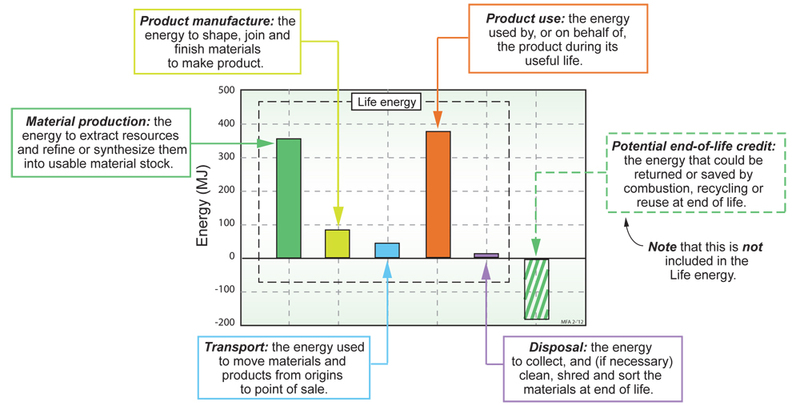 Each bar describes, for a given product, the energy consumed in each phase of the life-cycle: material production, product manufacture, product use, product disposal at end of life and the transport in between. The total life-energy is the sum of the five left-hand bars, as shown on the figure. The following stack of five fingerprints show what real Eco-audits look like. The first is typical of passive products, those that require little or no energy during use. 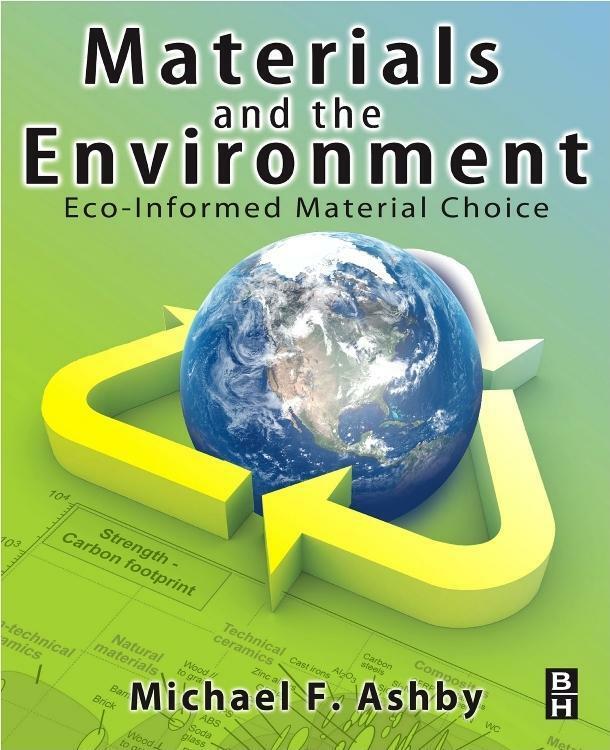 For these it is the embodied energies of their materials the make the largest contribution. The next two show products that require power to function. Number 2 is typical of small appliances (kettles, toasters, hair-dryers). Number 3 typifies larger energy-consuming products (washing machines, fridges). For these, it is the use-phase that dominates. Number 4 is broadly representative of transport systems. For planes, trains and trucks the red use-phase bar consumes far more energy that all the other phases of life together. For cars, the distribution is less skewed: the material energy is now a larger fraction of the life energy, though still much less than the use energy. The last example, Number 5, is typical of small hand-held electronics. The materials and manufacture of electronic products is energy-intensive and their lives are relatively short, so much so that the energy of materials and manufacture can exceed that of use. When one phase of life dominates, it is this dominant phase that becomes the first target for redesign since it is here that a given fractional reduction makes the biggest contribution. This much seems obvious, but it is not quite so simple. A redesign that reduces one bar may raise another. 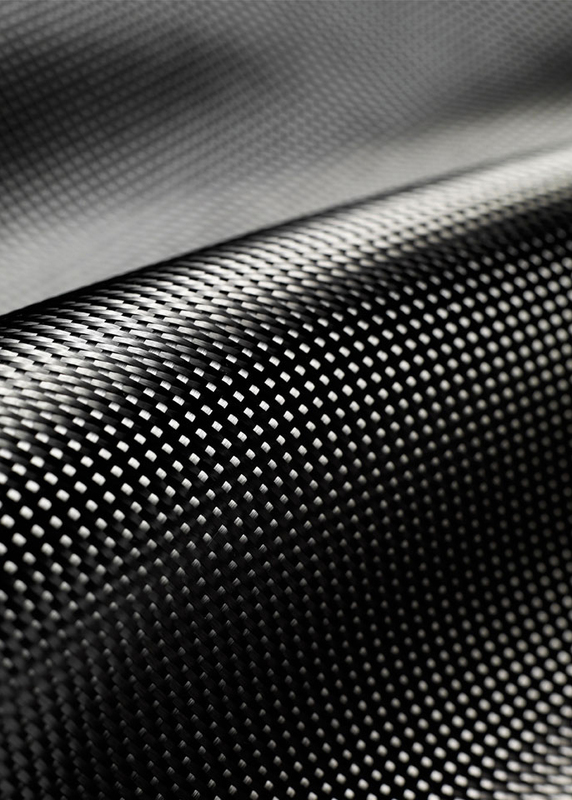 Cars can be made lighter by substituting the steel of the body by aluminum or by CFRP (carbon-fiber reinforced plastics). Lighter cars use less fuel, reducing the red use-bar for a given use-history. But both aluminum and CFRP are more energy-intensive that steel, raising the green material-bar. It is not obvious, without more detailed analysis, that the substitution will reduce the life-energy. And there is the end-of-life potential. It does not enter the sum making up the life energy, but it is important both in its own right and because legislation may prescribe it. The light CFRP car, today, cannot be recycled thereby contravening the current European ELV (2000) Legislation. Postscript. The five product fingerprints shown here are part of a much larger set on which the conclusions are based. Not everyone will agree with the assumptions made in constructing them. The project-files used to construct of them (bills of materials, transport, use-pattern and disposal route) can be down-loaded from the Granta Design Teaching Resource web site. They allow exploration of other set of assumptions the operator wishes to try. Mike is a Director of Granta Design, Cambridge UK, and is co-author of the book ‘Materials and Design – the Art and Science of Material Selection in Product Design’.